The Scape Group’s latest report — The Secondary School Places Challenge — provides an up-to-date assessment of the secondary school building challenge across the United Kingdom. LABM looks at the report’s findings and recommendations. The UK population is set to increase by 3.6 million over the next 10 years. By mid-2029 it is projected to pass 70 million and increase to 72.9 million in mid-2041. The population growth will place enormous pressures on our education system, with many schools already operating at capacity. The new research follows on from Scape Group’s 2016 School Places Challenge report, which found that 366,000 extra primary school places were required in England by 2020. As part of the research, Scape analysed the secondary pupil projection numbers from the Department of Education, The Scottish Government, The Welsh Government and Northern Ireland’s Department of Education to identify how many more schools and classrooms would be required across the UK to ensure there are enough school places. The latest projection figures show that while growth in primary school pupil numbers has begun to level off in England, the secondary school pupil population is set to see a significant spike as these children move into secondary education. The research suggests that there will be an extra 435,000 secondary pupils in the UK by 2020.21. With 15% of secondary schools already at or exceeding capacity, swift action is needed to accommodate the additional 400,000 plus pupils set to enter the secondary school system by 2020/2021. In this period, up to 13,337 classrooms will need to be provided in England — the equivalent of 381 new schools across nine regions to accommodate these additional pupils. In Scotland, the latest projection figures show the country will see a 6% increase in secondary school pupils, meaning 527 new classrooms will be needed. Wales and Northern Ireland would each need more than 300 new secondary school classrooms to accommodate students. These findings present a significant undertaking for the Government, local authorities and the built environment sector, who must together ensure that enough high-quality secondary school buildings are created in time. The report states that London will see the biggest increase with the capital set to experience a 15.5% rise in secondary school pupils in the next three years. This means the region would need to build more than 2,500 classrooms, the equivalent of 73 schools to maintain capacity. Each year London experiences pressure to provide new school places due to the nature of population trends in the capital. Data from GLA Intelligence predicts that the total population of London is projected to reach 10.78 million by 2041. With limited land available, innovative solutions around design and capacity must be considered. To consider the West Midlands and the East of England, both will see secondary school numbers increase by more than 47,000 which equate to just under 1,600 new classrooms. Even in the north-east, which will see the smallest increase in pupil growth in England (11%), 527 new classrooms will still be required — this is the same number of new classrooms required in the whole of Scotland. Outside of London, Manchester City Council is forecast to see the biggest percentage increase in pupil numbers. Primary school numbers are set to increase by 15% and secondary school numbers by 35% in the next three years. Increasing the numbers of school places across the city is high on the council’s agenda. To tackle the issue Manchester City Council is taking positive steps to deliver new and refurbished primary school facilities across the city. In addition to building eight new primary schools, the City Council opened a new secondary academy for South Manchester in September 2018 and has more academies and secondary schools in the pipeline. Devolution presents an opportunity for a collaborative approach to school building across the boroughs that make up the Greater Manchester Combined Authority, while the directly elected Mayor of Greater Manchester can act as a strong voice for the region to Central Government. The Welsh Government has accounced a second wave of investment in its 21st Century Schools and Education Programme, through Band B funding, which will see £2.3 billion put towards rebuilding or updating more than 100 outdated school and college buildings from 2019. Proposed by local authorities and further education institutions, the programme will address growth in demand for education delivered in Welsh, a reduction of surplus capacity and inefficiency in the system, expansion of schools in areas of increased demand and a review of assets, which could be made available for community use where demand exists. This second phase follows an initial £1.4 billion programme to help create new inspiring and motivating learning environment across Wales, known as ‘Band A’. A joined-up approach to modular — To bridge the school capacity gap, there must be an agreed approach between public and private sectors and Local and Central Government on new solutions such as offsite construction. A cohesive national strategy on modular for new schools could significantly reduce the amount of time it would take to provide areas with much-needed school places, but there needs to be significant investment behind this. If modular can grow in scale, building schools will become cheaper and more cost-effective. A shared space — The availability of land is a major challenge, so utilising the space available is key if the UK is to be able to provide a sufficient number of school places to meet a growing population. Combined schools, which host both primary and secondary schools, as well as nurseries, offer an opportunity to maximize value for money, whilst planning for future growth. Investment in extensions — Greater investment in extensions for schools would improve the time and costs associated with creating much-needed new school places. Building extensions on existing schools would be a more efficient use of resources, should they be easily extendable. 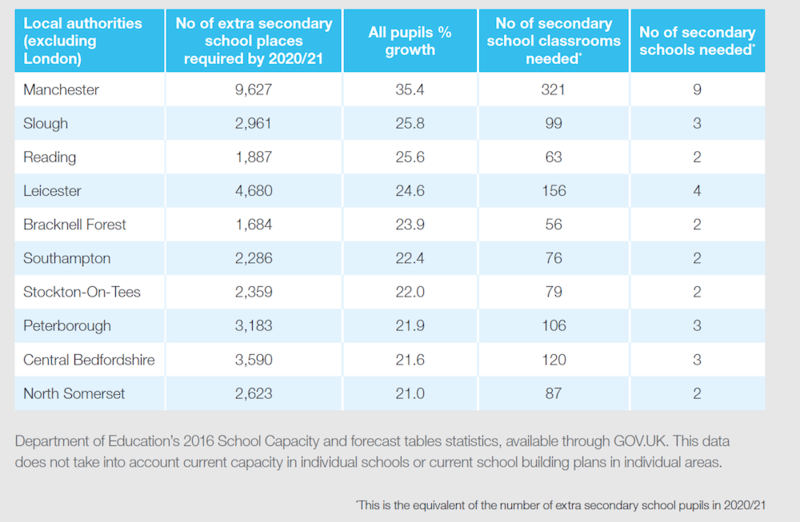 Building up — Local authorities could significantly reduce the number of schools they need to build by 2020, by building up. Designers of schools on smaller sites in more built-up areas could be more creative with their approach, by adding more storeys to the schools. This would allow for significantly more classroom space, however it would not be advisable to build a primary school, which is more than three storeys. Building a community — Currently, Section 106 Agreements with developers are one of the main methods local councils use to build new schools in growing areas, but the process could be made much easier for local authorities by putting school building at the beginning of the planning process, rather than at the end. This would allow for schools to be built by developers at the outset, as opposed to after a development is built. 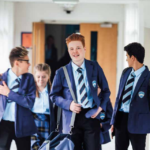 The thorough research, findings and recommendations included in The Scape Group’s The Secondary School Places Challenge make it essential reading for all those involved in the future of education and the wider community.